Home page → Computing → Managing Google Account Storage: How to clean Gmail, Google Photos & Google Drive for more storage space? Using Gmail for years? Added Google Drive to integrate your files? Well, sooner or later your 15 GB of Google storage that is shared among the Google services including Gmail, Google Drive and Google Photos will exhaust the storage space. Here we discuss on best ways to manage Google Account Storage – free up size of Gmail, Google Photos and Google Drive. However, there are some steps to clean and manage your Google Account storage space before you go on to purchase 1.99$ per month 100 GB storage in Google cloud servers. 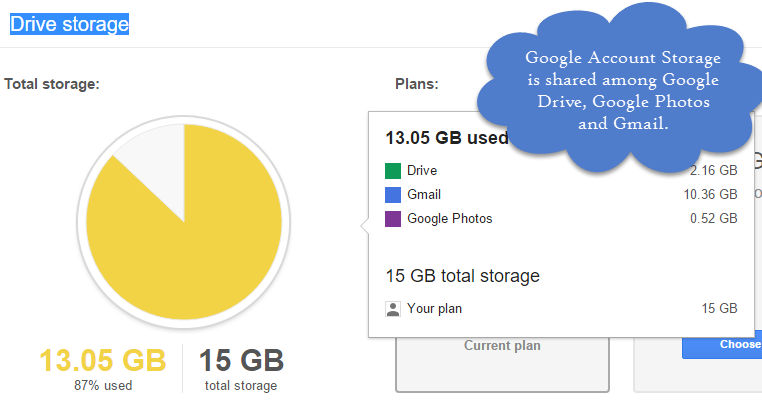 Google Account Storage of default 15 GB is shared among Google Drive, Google Photos and Gmail account. Check size of files in Google Drive and remove the larger files to free up storage space. Check to see which largest files are costing to your Google Drive storage. Files in the native Docs, Sheets, Slides, Forms & Drawings formats do not consume any storage space. Head over to Google Drive at https://drive.google.com/drive/u/0/ where you can see the size of the files on the folders. Google Drive does not provide us file size sorting facility yet, hence you are required to check storage space manually. You can now know where the big files were hiding in your Drive and get rid of those large files eating up your storage quota. 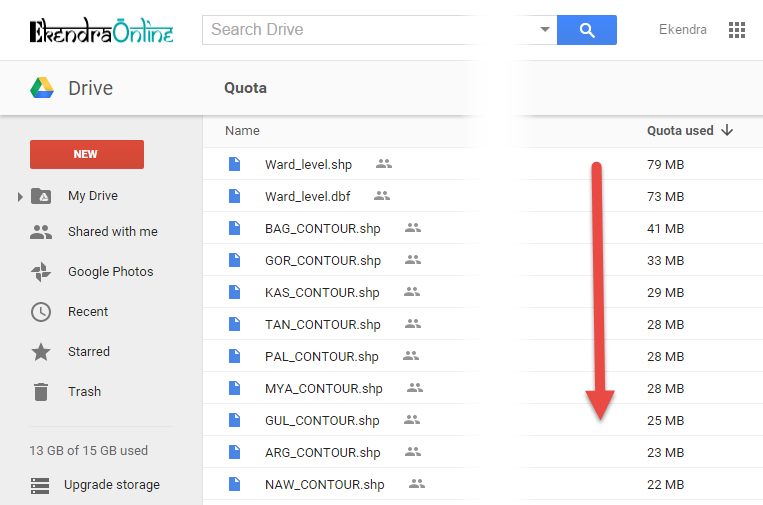 However, using a small trick, you can easily find the biggest files in your Google Drive and sort them easily, simply visit this URL https://drive.google.com/drive/u/0/quota which sorts biggest files in size. Right click those bigger files in your Drive, Locate their place in the Drive and remove them to gain space. How to find Google Drive Folder Size? There is a third party utility app for this known as “gdrive folder size” which access your Drive and analyze them to display each and every Google Drive Folder’s size. 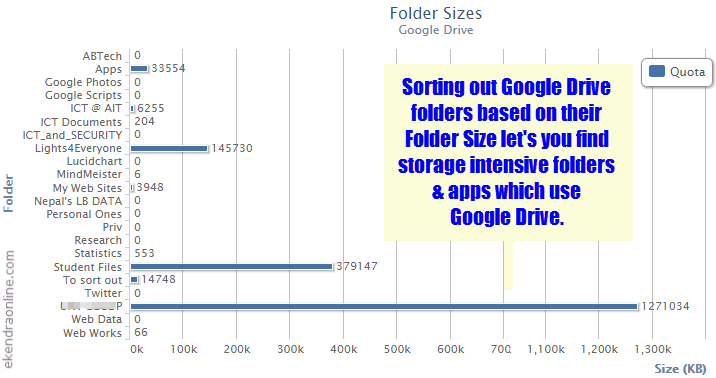 Google Drive Folder Size analyze your folder and create chart according to folder size. So, far this is the best tool to find exact folder size in Google Drive. 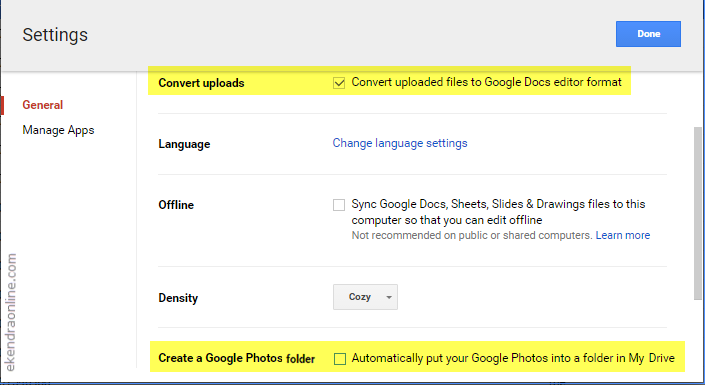 If you enable an option to automatically convert uploaded files to Google Docs editor format, those documents do not count towards your Google Drive storage. Moreover, you can attach (literally) or send links or share those files and documents to your friends as usual. With Google Photos, you have free unlimited cloud storage for high quality digital pictures and videos which Google compresses after uploading to the Photos. However, if you upload full resolution photos, you end up consuming your Google Account Storage. So be careful on your choice. For sure, you can view and manage your photos and videos in both Google Photos and Google Drive, on the later by creating a Google Photos folder in “My Drive”. However, this count to your Google storage space (though it’s counted only once, it is consuming your space) if you have full resolution upload enabled. If you are uploading high quality – no storage issue – option, then you can for sure enable and create a Google Photos folder inside the Google Drive. 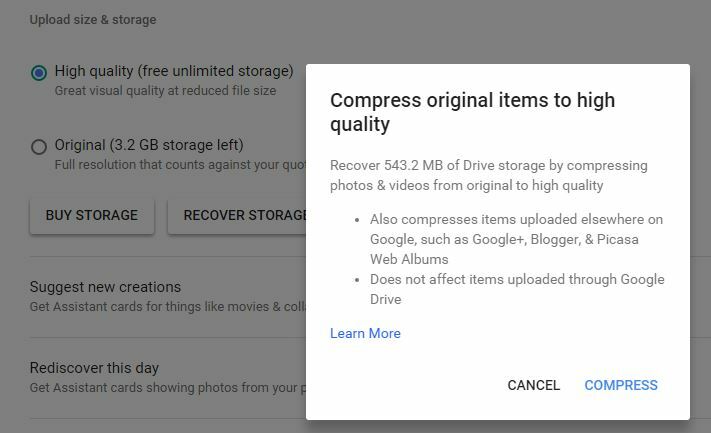 If you had previously used original upload ie full resolution photos and videos uploaded to your Google Photos, you can recover storage space by compressing those original items to high quality. This action compresses items uploaded elsewhere on Google, such as Google+, Blogger and Picasa Web Albums. However, compression does not affect items uploaded thru Google Drive but only thru Google Photos. To compress your original uploads, go to settings in Google Photos and then proceed with “Recover Storage”. How to sort Gmail emails by size? Okay, now is the time to clean your obsolete and high size email attachments to make some more Google storage. 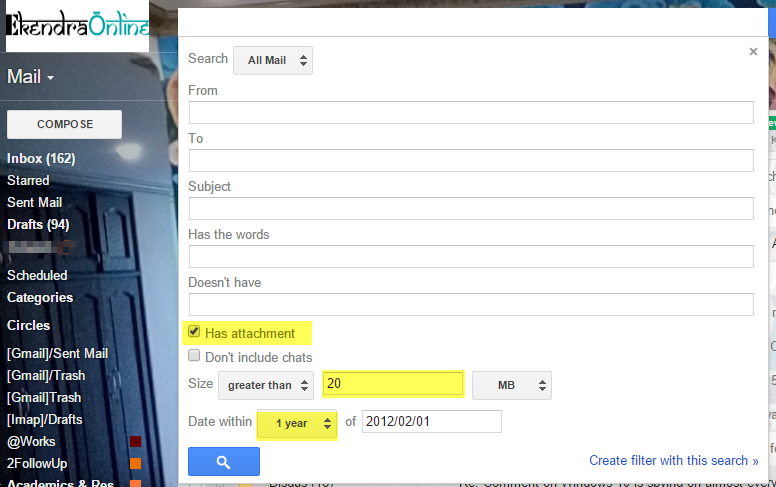 Use advanced search feature in Gmail to find email attachments that you want to find and delete. In the above screenshot, the search will find 2 year old email messages which have attachments larger than 20 MB. So, 10 such attachments will buy you 100 MB storage in happiness. You can use such search operators and filters to find and delete obsolete conversations and attachments from your mailbox. Another awesome way to sort Gmail messages by size is to keep track of individual Gmail messages onto a Google Sheet by using a Google Script provided by Labnol here. Well, I had 161,168 conversations in my mailbox reduced to mere 78,812 after fine tuning and sorting messages. 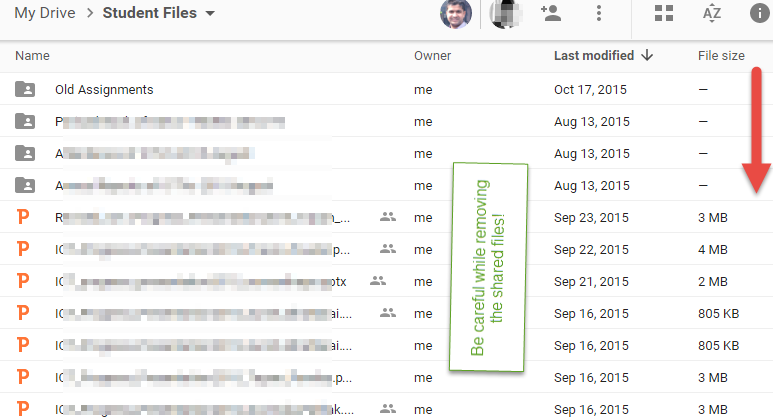 One wonderful way to preserve your Gmail storage is to forward each and every emails received on your mailbox to some other email address or alias of the same domain. Simply apply some filters and you will even never regret accidental deleting of messages while still have plenty of storage. Facebook photos "content not found" image URI issues fix.